With cool mornings and fall just around the corner I’ve been wondering how to use / preserve my garden herbs. This is a wonderful idea with limitless possibilities. I’m feeling happy for the emergence on the food scene of Olia Hercules. I saw this film a while back and felt really thrilled to be learning from someone so deeply rooted in her own food traditions (and she’s deliberate on that plural) yet gifted with such a light and beautiful cook’s touch. That Ukrainian Green Borsht of hers is of course a much more vivacious cousin to my prosaic Schav. Today in the Guardian is an excerpt from her new book Mamushka. I want it! Want want want! Because I know I’m going to be bowled over with inspiration, just as I was simply from reading about the way she uses fermented herbs in her lovely and simple soup. Make sure to check out the link. Her version uses dill, parsley, sorrel, celery, and spring onions. 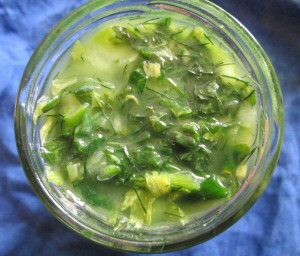 Thanks for reblogging this 🙂 I’m beginning to discover how these fermented herbs are useful, including in Green Goddess dressings https://kitchencounterculture121.wordpress.com/2015/07/30/godd/. Love your blog. Previous Post Are You Feeling Tired, Run Down, and Listless? Next Post Is stress controlling your life?